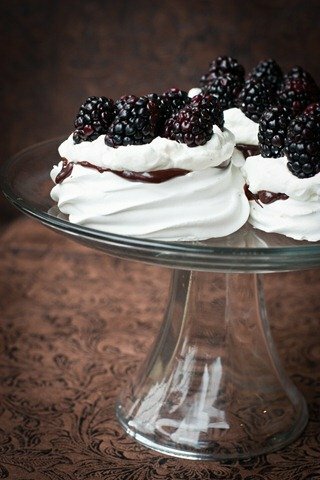 Meringue Baskets with Blackberries - Let the Baking Begin! Miniature versions of the Boccone Dolce are always a hit at parties with no messy cake cutting . 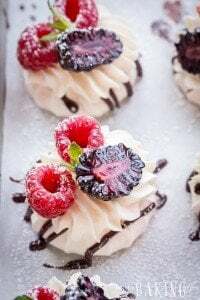 Cousins of the Pavlova dessert they are slightly crunchy meringue baskets filled with Chantilly Cream, Berries and Chocolate Ganache. Yum! I had a ton of leftover egg whites from another dessert and what’s better use for egg whites than these refreshingly delicious and light on the tongue Meringue Baskets with Blackberries? 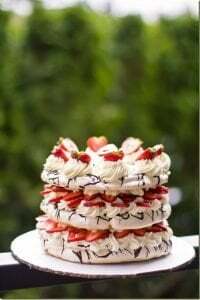 If you remember the cake, you will notice that these meringues are much whiter in color then the above-mentioned cake. That is because I used my countertop oven to bake the meringue which goes as low as 150F if needed. It takes more time to dry them, but the reward for your patience is the snow-white color of the meringues. If you don’t really care if it’s that white or not, you can dry them at 200F, or even 220F (these are more cream colored than white) for less time. 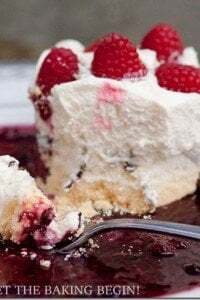 You don’t want to make the baskets too small or they will absorb the moisture from the cream too quickly and become neither crunchy, nor soft (like Pavlova), but kind of soggy, so stick to the size mentioned in the recipe. Chips Galore Cookies – A great cookie recipe. Hazelnut Chantilly Cream Tartlet – Simple tartlets with a salted caramel ganache. Raspberry Scones – The best scones. Prepare a pastry bag, fitted with a plain round 1/4 tip, or a star tip. Drape the pastry bag over a tall glass. Turn the oven to 150F (or 200F if your oven doesn’t go to 150F). With a mixer fitted with whisk attachment, start whipping the egg whites on lower speeds (KitchenAid speed 3-4). When they have tripled in volume, look white and foamy, start adding the sugar, one tablespoon at a time. Continue whipping for about 10-15 minutes, until the meringue is thick, white and glossy (dip the whisk attachment into the meringue, quickly pull it up, now put the whisk upside down and only the top 1 cm of the tip should ‘droop’). Transfer the meringue into the prepared pastry bag, twist the end closed. On prepared parchment paper, make 2 inch circles, by piping out a swirl, then go around the edge 2 times, creating a ‘rim’ to your basket. Bake for 2-3 hours at 150F, or 1.5 hours at 200F. Make sure the meringues are dry before you remove them from the oven. To check, remove one meringue from the oven and let it cool. If it feels weightless and when you knock on it, it sounds hallow, then it’s ready. If not, just place it back in the oven and let it finish drying. 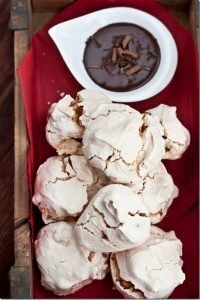 When the meringues have baked, pour the hot heavy cream over the chopped chocolate, and let sit for 1-2 minutes. With a whisk or spoon, mix until smooth. Drizzle on the inside of each meringue baskets, allowing for some drizzles on the sides of the baskets. 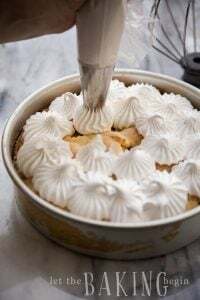 With a mixer, fitted with a whisk attachment, whip the chilled heavy cream and vanilla extract until thick and smooth, add the sugar and mix for another couple of seconds, taking care not to overbeat. Refrigerate until ready to use. Spoon the Chantilly Cream into each meringue basket. Serve within 2-3 hours from the time the Chantilly Cream was added. Hi, I was hoping to make these for Christmas and was wondering at what point do you add the cream of tartar? Also, can these be made with a hand mixer, as I do not own a stand mixer? And lastly, for the star tip, is it a large one or a small one, because i only have the wilton 1D and 2M? Cream of tartar is added at the beginning when you start whipping the egg whites. Oh that’s wonderful to hear, I hope it all goes well when you do it! Do you think that this recipe can easily be doubled if I need to make more at a time? Yeap, you can double it without a problem as long as you’re able to bake them all at the same time. If they don’t fit in the oven at once then you need to whip two separate batches, otherwise they will deflate by the time the first batch is dry. hey I was wondering when do you add the pinch of cream of tarter? after the egg whites triple and before you add the sugar or after you add the sugar? I did your recipe twice and first time I added it towards the end with sugar and they turned out perfect and the second time I added them before beating the whites and for some reason it took so long to dry them and yet some were still a bit sticky underneath. You should add it to unwrapped egg whites, so that when they foam up, they hold shape. Longer drying temperature and stickiness is usually caused by over shipped egg whites, or a very humid day. How many days in advance do you think I can make the meringue baskets themselves? Probably a day or two, but then keep them in a closed container away from moisture. What a beautiful photo! Blackberries are very photogenic, don’t you think!? 😉 Glad I found your webiste! I’m glad you visited, because now I know about your blog as well! What a lovely dessert! I love meringue.